Paul Cotcher of Red Star Scale Models is back for another contribution to our Other Voices series. Paul has long had a strong interest in Soviet and Russian subjects, so it's only appropriate that you hear his comments on the new Kitty Hawk Su-17 and the response from rivet counters upon seeing it. Fair warning, this article is the modeling equivalent of our parents describing walking to school in the snow, uphill – both ways. Time to practice a little modeling relativism, so if that might push your buttons, you may want to stop reading now. Otherwise, let’s take a trip down memory lane. In the days before the internet, every trip to the hobby shop could bring a surprise, there were no CAD renderings posted ahead of time, no product listings, no Facebook (or Hyperscale, ARC, or even rec.models.scale). And if the local hobby shop wasn’t good enough, a trip to an out of town hobby shop could bring even more modeling goodness. In the early 90s I frequently travelled to Miami on business, and used those trips to frequent Orange Blossom Hobbies. Not only did I get to meet a bunch of people that I still consider good friends, every trip revealed something new that I had never heard about before. Those of us that have been around the hobby for a while can certainly remember these discoveries. On a visit one summer day, I recall walking in (after the ride up from Bucks County, PA where I was staying) ready to shuffle through the dusty piles, after all, that’s what was required to really find what was in stock at this (and so many other) shop. What to my amazement should appear but a brand new 1/48 Su-17 from KP. Talk about modeling gold! A 1/48 swing wing Fitter! I was in modeling heaven. Not thinking for a minute, it was going home with me. Of course, they didn’t take credit cards, so I had to ask that they hold it while I went to find an ATM. Long story short (no, Steven Zaloga, you can’t have it), it was on its way home with me. First inspection showed that it looked a lot like an OEZ kit. Which later was confirmed. 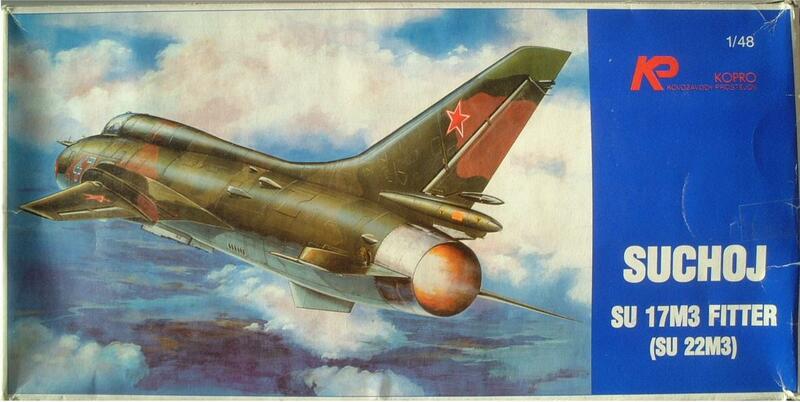 OEZ had sold their efforts to KP (Kopro) resulting in their last tooling showing up under a different brand (I guess at one time they had a MiG-23BN planned, too). It was certainly more refined than the Su-7 that I had previously built. Still crude (mid-90s crude) in some areas, but again, better than the other OEZ kits I had in the stash (keep in mind there was no Academy MiG-21 yet, so that included the OEZ MiG-21 kit). Fast forward a few months, maybe even a year or so, and it was time to build the beast. Likely the release of the Cutting Edge cockpit for the kit was what pushed the project over the Go line. Like most projects it was simple to get the cockpit together, but the small amount of work in to get the resin fit to the kit, and then the fuselage together. After all it was just two fuselage halves, putting those together can’t be hard. But (and here’s the but), from that point in the project fought me every step of the way. Things I remember being difficult include the main wheel well where half the well wall was molded with the upper half of the wing and the other half was molded with the bottom half. Well that will leave a heck of a seam...if the two wheel well halves even matched up. They were so offset that a totally new set of walls had to be fabricated to get one smooth wall all the way around. Seemingly everything had to be trimmed, shimmed, blended, or otherwise spackled in place. Pylons were not molded to one side of the wing or the other, and had to be filled and carefully blended. The large wing fences were split requiring careful filling and sanding. The landing gear was an atrocious approximation of the complex gear on the real aircraft (heck we had new books coming out to show us what these things really looked like). One problem after another. And let me be perfectly clear here, I am only glossing over the bigger issues. Suffice to say, I fought it all the way to the finish line, and LOVED every minute of it. It was a 1/48 Su-17, and I was darned glad to have one to build. Despite this, I had others in my collection over the years, and even built up a host of additional details to do a “really nice” build. Cutting Edge cockpit, exhaust and outer wings, resin wheels from TallyHo!, a host of etching from Eduard and Part, weapons and pylons from Art Model, and then at the very end came Ciro and their glorious wheel wells (that fixed the out-of-register main wheel well halves). All of this would have made for some spectacular detailing on a kit that was still a bear to build. Project cost was probably in excess of $250 by the time you secured all the add-ons – not to mention some aftermarket decals. Despite many false starts I could never get myself to really engage on the project again. Would get the kit out, tinker a bit and then turn my attention to something newer. In the two decades, give or take, since I built the first one, I never built a second. I am a far better modeler now then I was then. Better not only in terms of skills, but also better in terms of tools, materials and techniques that have come to light since that time (I mean, Squadron Green putty, am I right?). 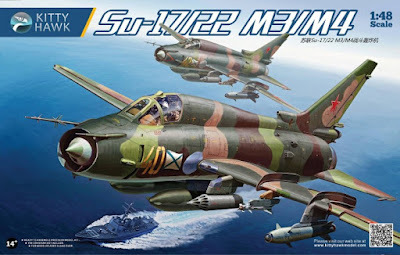 As we moved into the last four or five years with the onslaught of new 1/48 jet kits, it then became a matter of time before a new Su-17 would present itself and I would be able to build a new and improved Fitter (and the good Lord willing, all the earlier versions too). So where is this whole thing going Paul, that’s a great story, but what’s your point here? Thanks for asking! There is most definitely a point. Today, on my front porch, I found laying a brown corrugated box in the characteristic model kit dimensions. In that box, was a brand new 1/48 Kitty Hawk Su-17M3/M4. The kit is GLORIOUS. I’ll have details on my website and Facebook page (probably by the time you read this), but in the interim, let’s talk about why it’s a great kit, and why you almost certainly will have heard otherwise. From the moment this kit was announced, it was already decried as a piece of garbage. Because of brand alone, it was already doomed in the eyes of many. Doomed not only to those that like to use such statements as “debacle” or “dumpster fire” or even “horribly misshapen monstrosity” to describe flaws in kit designs, but doomed to the people that just read those statements in passing and assume them to be gospel. After all everything you read on the internet is true, right? Unlike the good old days, we get to carefully monitor each dumpster fire in progress, much like the 24 hour news cycle. Each step of a release is carefully charted on modeling forums everywhere. Announcements are made, CAD renderings are displayed, test shots come out of the mold machines, first kits are assembled, early releases reviewed, and only then does a release get to mass market. By that time the Photoshop and red pen brigade have sliced and diced every nuance of every photo. So as we proceeded through the release process on the Kitty Hawk Su-17, we see the CAD, and it looks pretty good. We see updated CAD, still pretty darned nice. We see the first test shot build – wow that looks great! We finally see parts on the trees, those looks great, too. Wow, it’s a legit 1/48 Fitter! Yet even with all of this, the haters are still there, and more importantly those that read the hate go into the release expecting it to be wrong and not worth their while. IT’S NOT THE OEZ/KP/KOPRO/KARAYA/EDUARD KIT. End of discussion. Somehow we’ve gotten ourselves into the practice of comparing every kit to some idealized non-existent kit that can never be achieved. Yeah, there’s Tamiya, they seem to be the best blend of engineering and fidelity, but they come at a price, and come out with maybe one subject a year. We need to stop comparing against unrealistic ideals and maybe look at some more realistic comparisons – like what else is out there in the 1/48 Su-17 space? Here’s a clue: It’s that project I so lovingly described above. It was a beast to build, it was full of accuracy issues, and to get it to a similar standard, would cost three to four times as much as this new kit will cost. Fair and full disclosure – there is a Hobby Boss kit coming of the same subject – not sure when, but it’s in their catalog. Maybe that will fix the canopy issue, but from what we’ve seen of early test displays, it’s not as accurate as the Kitty Hawk kit. Beyond that, you’re hoping that somebody else does a better job, but at this point you’re hoping for something that’s FAR down the road, and nothing more than a wish at this point. Kitty Hawk, Hobby Boss, Ideal Future Kit or KP – that’s your choice. Nope, sorry, I forgot one, there's the Evergreen kit too. There's always the Evergreen kit. So back to that whole modeling relativism thing. We need to stop comparing to the imaginary and start looking at what’s in front of us. Ninety-five percent of kits are really good releases and so far and away better than what has come before. We’ve lost track of that. Every once in a while something really superb comes along, but even then, there’s a flaw somewhere, or the panel lines are too heavy (even if everything else is near perfect), but those releases are the exception and not the rule. Secondly, if you’re really into a given subject, you’re going to be willing to put more effort into the build then somebody only casually interested in the subject. That said with the huge variety of new kits coming, there has to be just about something for everyone at this point. And yes, I get it, we want to hold the manufacturers to a higher standard. The reason why the kits are so good today is because of the input that has been received by customers over the internet years of modeling. But while the standard has gotten better and better, the complaining about accuracy issues has not. Endlessly chasing down accuracy issues comes at a price, and in most cases, manufacturers will cut a corner here and there to keep the price of a given release in the reasonable range. Look up hyperbole (see also click bait) in the dictionary, then look at many other pieces of new, postings or similar pieces of content (whether modeling related or not). It will put things in perspective. Stop worrying about what’s being said online about a kit or manufacturer. Chances are it’s something you’d never see if a subject matter expert hadn’t pointed it out in the first place. If you’ve built a few models, chances are you’ll be able to overcome any fit issue that you come across. Remember these are model kits and not Lego sets. Maybe the whole “kit doesn’t fit” issue is something that I need to address in a separate article (this one is long enough). Don’t apologize for what you’re building because somebody said something bad about the manufacturer or the kit. If you like it and had fun with it, a lot more people want to hear about your experience with the kit than with further comparisons to the imaginary ideal. Guaranteed that 90 percent of the folks who view your model, whether online or in person, will be blown away by the effort. If you’re into a given subject, build the kit, because chances are a better kit is a lot further out than not. Unless it’s a P-51 or a Tiger tank, there will be another release of one of those in five, four, or three years. Finally, it’s a hobby, it’s supposed to be fun, build the darned thing and stop worrying about what some expert said. If I can build and enjoy the KP 1/48 Su-17, then it’s a virtual certainty that you’ll be able to enjoy the Kitty Hawk release. All a matter of perspective. The opinions expressed above are those of the contributor and not necessarily of Scale Model Soup. I am not a Russian jet builder. But, I am a Russian jet viewer, in fact, I look at every model that I see, everywhere I am. I fully agree with the "compare it to what we used to get" premise in Paul's article. I laughed at the line "there is always the Evergreen kit",it is so very true. In addition to comparing old and new kits, instead of new kits to some mythical future kit, there is still "kit-bashing." It is one thing to say "this nose is wrong on this kit", "this tail is wrong", "these wings are wrong",,,,and quite another to identify those items and then use the best parts from 2 or more models to get "perfect." (whatever perfect really is) The problem with kit-bashing is that when we do it, we throw the whole build-ability deal out of the window. We only have 4 choices for any given subject,,,,New kit, Old kits, Kit-Bashing,,,or the Evergreen Kit. And the New kits go together so very well, usually. Great points Paul, I couldn't agree more with you. I think part of the problem is that many of our younger modelers, weren't around to have to try to build what passed for kits back in the day. Frog, Novo and god forbid vacuforms et al????? You mean *gasp* actually expend some effort and skill? How dare you imply that!!!! Good article. Make the most of your hobby! I'm sick to death of armchair experts and their red pen mentality. Some modelling skills required? Good! Makes me raise my game! I've built a LOT of models in my lifetime. I used to scratchbuild entire aircraft, won my fair share of awards that mostly have gone into the garbage. I no longer build for competition, I get them to a point where I am happy and they look great sitting in my display case. I fix what bothers me but not anything that will take too much effort or no one other than the mechanic who actually works on that aircraft would ever notice. On some board some guy was trashing the new Hobby Boss Su-27 because the inside wall of the wheel well, which you can barely see, has too much of an angle and that's why he will never buy the kit. Of course, others chimed in in agreement. I pointed out that the kit is generally superb and no one will ever notice that minor flaw, which resulted in him belittling me for my lack of standards. Well, I have a finished Su-27 in my case that I am very happy with, what does that guy have? Generally these are people who don't actually build a lot of models. I have read many varied opinions on this kit from each side and I honestly think there are some good points to be had on each. I like Matt's point of holding kit manufacturers feet to the fire by voting with our wallets. But I understand the other side of if it is one of the few available kits of a subject you like you will tolerate some issues to have the end product. But I think the industry could use a different rating scale. To be blunt the majority of modelers could not build the KH kit without significant issues. Basic modeling skills as commonly used are anything but basic. So what I think we need is a build ability scale that lets hobby builders understand that a kit has serious challenges vs those kits that have excellent fit and engineering, and everything that falls in between. The problem as I see it in implementing such a scale is that the subject is just that, subjective. It is easy to forget what it felt like to build your first few kits after years of building. This is why I think we need to make our opinions heard to kit manufacturers and honestly the only thing some of them listen to is poor sales. I agree comparing an existing kit to an idealized "someday" kit is foolish, but it is NOT wrong to point out deficiencies that exist in a current kit. Especially if they affect its build ability. Neither is it wrong to go ahead and build it if you have the skills and like the subject.